Our range of soil water content sensors measure the exact amount of moisture in soils or substrates. The equipment is low cost, easy to use, robust, and requires virtually no maintenance. Therefore, it is ideal for researchers, growers, students, turf and golf courses, arborists, irrigation control and more. We have portable meters, data loggers, telemetry systems, irrigation controllers and profile probes to measure moisture in the field, glasshouses, pots, or artificial substrates. Combine our sensors with EC, temperature, water potential, weather sensors, sap flow, dendrometers and more. Edaphic Scientific supplies a large range of sensors, meters, probes and data loggers for soil moisture and substrate measurements. 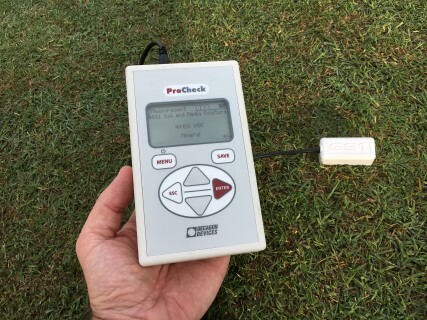 Whether you are a researcher, grower, consultant, turf or golf course manager, or student, we have a soil moisture probe for all situations. Various types of soil moisture probes are available for the monitoring of soil volumetric water content. The first difference is whether a probe is portable or installed for in-situ, continuous measurements via a connection to a data logger. Following this, the main differences are the actual physical appearance of the probe and the method of measurement. In terms of physical appearance, a soil moisture probe could either be a point probe or a profile probe. 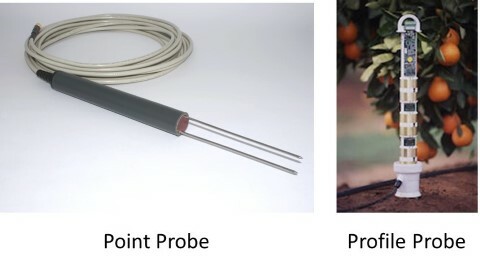 A point probe, also known as a soil moisture sensor, are about 5cm to 10cm in length and are ideal for measuring soil volumetric water content in soil column research, shallow soils or pots in greenhouses, glasshouses and nurseries. Soil moisture sensors are also typically used to measure the water content of artificial substrates in commercial greenhouses or grow rooms. Click here for our range of soil moisture sensors. A profile probe has at least 2 or more soil moisture sensors attached to, or embedded inside of, a rod that is then inserted into the soil. Each sensor is installed at, at least, 10cm intervals and can, theoretically, be installed to any depth in the soil. We have undertaken projects where profile probes have been installed to 20m to 40m depth in the soil. Typically, for a agricultural crop such as wheat or cotton, profile probes are 1m to 1.5m in length. In forestry or scientific experiments, profile probes may reach 3m to 5m in length. Click here for our range of soil profile probes. In terms of method of measurement, the soil moisture sensors and probes supplied by Edaphic Scientific are based on either the capacitance or time domain reflectometry (TDR) techniques. The Soil Water Compendium has detailed information on these, and other, methods of soil moisture measurements. There is currently no sensor available that directly measures how much moisture, or water, is contained in the soil. Rather, soil moisture sensing technology estimates soil moisture based on well known electrical properties of water, solids and air. Common soil moisture sensors, such as capacitance or TDR probes, actually measure the dielectric permittivity of the soil. This property of soils is basically how much electrical charge a soil can hold or store. A soil that has a higher water content can potentially store more electrical charge. 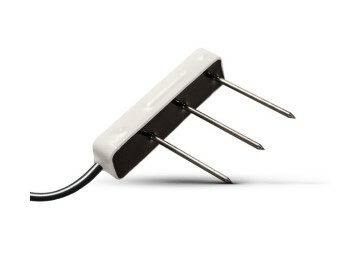 The dielectrical permittivity ranges from 1 in air to 80 in pure water. 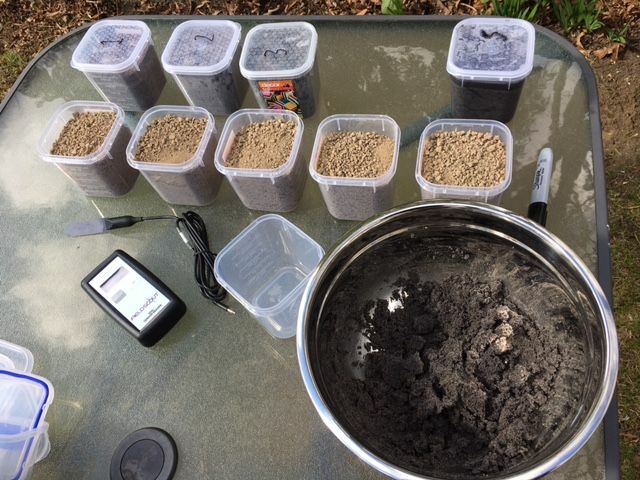 Air-dried soil has a dielectrical permittivity value of about 5, whereas a saturated soil has a value of around 50. 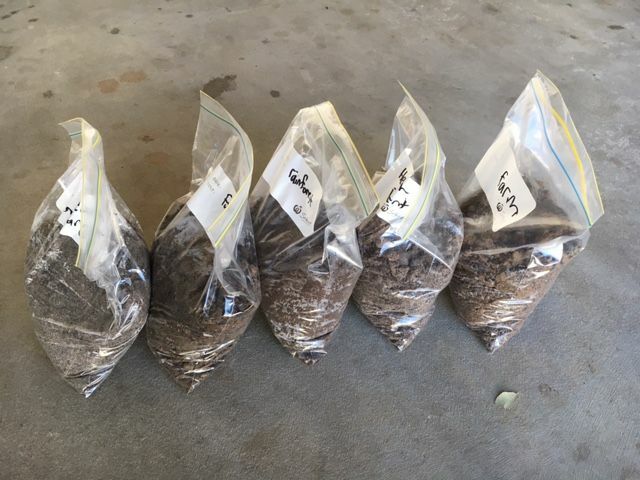 As there is a large range in values between air-dried and saturated soil, engineers and scientists can calibrate a sensor so the output is meaningful to a grower or hydrologists. For example, a sensor measures the electrical charge of a soil and the measurement is given in millivolts (mV) where 250 mV may be very dry soil and 1500 mV is saturated soil. The values of 250 and 1500 are fairly meaningless to a grower, scientists or hydrologists. Therefore, with a calibration, it is possible to convert the mV values to a volumetric water content percentage value. A calibrated result may then be 5 % for the very dry soil and 55 % for the saturated soil. A value of 0 % will be a measurement taken in air, and a value of 100% will be a measurement taken in water. These percentage values now have meaning in terms of knowing how much water is in a given volume of soil. The soil moisture probes and sensors provided by Edaphic Scientific have their own, pre-determined calibration curve. However, many researchers and growers prefer to calibrate their soil moisture sensors to their own specific soils or application. This is a brief overview of how to calibrate soil moisture sensors. Contact us for more information or further assistance. Step 1: Collect soil samples from the field and return to the lab or shed. 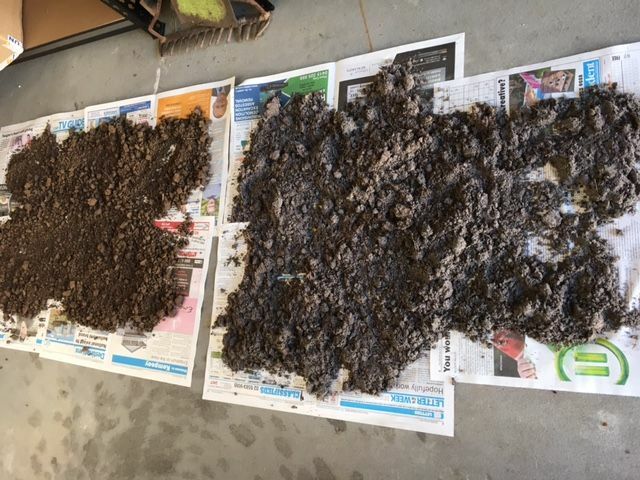 Step 2: Air-dry the soil by spreading the soil samples out across newspaper. Ensure to keep your soil from different soil types separate and do not mix together. Remove any stones, rocks, roots or other unwanted materials. Break down any large clumps of soils. Air drying the soil may take several days to a couple of weeks, depending on the initial moisture content of the soil and how dry/hot the air is in your lab or shed. Periodically turn, or move about, the soil so drying is even across the entire sample. Step 3: Once soil is sufficiently dry, transfer the soil into plastic containers that are large enough to accommodate the entire length of your soil moisture sensor. For example, the SM100 Soil Moisture Sensor is 5cm in length, therefore your plastic container should be larger than this, if not at least twice as large. You should, at the very least, have 3 plastic containers but, preferably, the more containers you have then the more accurate your calibration. In our experience, 10 plastic containers is sufficient for an accurate calibration. Step 4: Once your plastic containers are full with soil, you will need to create a spectrum of moisture across all of your containers. Leave the first container as the air-dried sample. In the second container, add a small amount of moisture. In the third container, add a bit more moisture, and so on until the last container is full of saturated soil. You can use your soil moisture sensor to check that you have a range of soil moisture from very dry to very wet. When adding moisture to each container, ensure to thoroughly and evenly mix the moisture through the entire sample. It is critically important that moisture is spread evenly throughout the container and not clumped at the surface or some other location. Step 5: In each container, measure the raw millivolt (mV) or count value from your soil moisture sensor. Note this value in your workbook. Typically, the air-dried sample will have the lowest mV value and the saturated container will have the highest mV value. Step 6: Remove a portion of the soil from each container, one at a time, and weigh this portion on a balance. Note this value as your wet soil weight. Once you have weighed a portion of soil from all of your containers, place these into a drying over, set at 105 °C, and leave for at least 3 days to oven dry. After 3 days, or when the soil is completely oven dried and contains now more free moisture, remove the samples from the oven and re-weigh. Note this value as your dry soil weight. Step 8: Many researchers and growers are interested in knowing the volumetric water content (VWC) value. 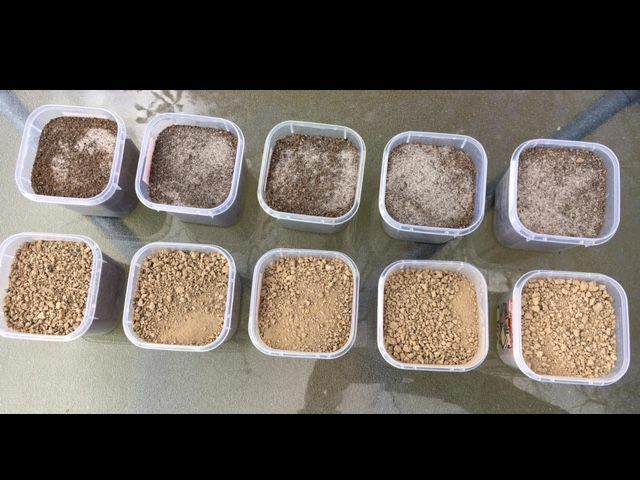 To calculate VWC, simply multiply GWC by the soil’s bulk density. Other researchers may determine bulk density at Step 3 in the above procedure. In this approach, samples are packed into the containers at a known density similar to field conditions where the soil was first sampled. With this approach, you should consider packing the soil into a steel or tin container, rather than a plastic container, that can then be placed into the oven to dry the soil. Another approach is to determine soil moisture in the field. This approach is slower than the approach described in the steps above, but it may better reflect field conditions. In this case, with your soil moisture sensor, take a measurement of the soil in the field. Then, with your stainless steel cylinder, take a sample of the soil where you just inserted your sensor. With the soil sample in the stainless steel cylinder, take this back to the laboratory to measure the wet and dry weights as described above. Repeat this procedure at several times, when you know the soil in the field is wetter or drier, so that you have sufficient data to fit a calibration curve. Just about all commercially available soil moisture sensors are delivered with a manufacture’s recommended calibration. How the manufacture actually derived the calibration curve is not always know – it could be an average of several different calibration curves from a range of soils, or it could be a single calibration curve from a soil near their office. In any case, the chances are the manufacturer’s calibration curve will be different to the curve needed for your specific soil type. Well, in some cases, there can be significant differences and this could lead you to making the wrong management decision or misinterpreting your scientific results. The following graph demonstrates this point. The y-axis represents the real soil volumetric water derived in the laboratory, as described above. The x-axis is the volumetric soil water content that was measured with a manufacturer’s recommended calibration curve. There are three curves on the graph for three different soil or substrate types: potting mixture, sand and a loamy clay soil. 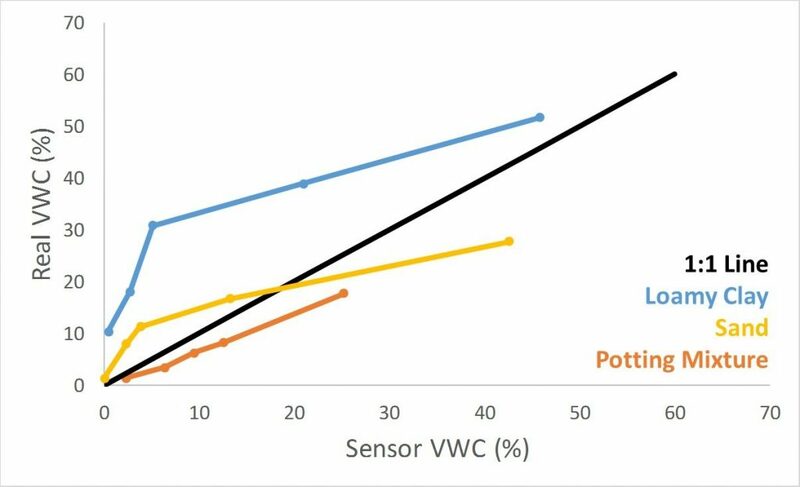 As can be seen from the graph, none of the sensors have a 1:1 relationship with the real soil volumetric water content for any of the soil types. The sensor in the loamy clay measured 2% when, in reality, the value was 18%. In sand, one of the readings in sand was 2% when, in reality, the soil had a volumetric water content of 8%. Such large differences in measured versus real data can have significant ramifications for irrigation management decisions, or interpretation of results for scientific or consultants reports. Edaphic Scientific always recommends soil moisture sensors are calibrated for the most accurate measurements.